Jay Dean Vineyard age 84 of Webb City passed away on Tuesday, April 24, 2018 at his residence. He was born on August 31, 1933 in Weir, Kansas to Charles Vineyard and Jenny (Gillenwaters) Vineyard. 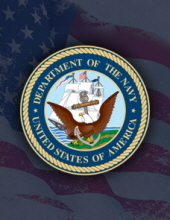 Jay was a United States Navy Veteran, and retired from Leggett & Platt, Inc. after 35 years as an accountant. He married Mary (Scott) Vineyard on April 17, 1954 in Weir, Kansas and she survives at home. They just celebrated their 64th wedding anniversary. Jay is also survived by his sons, David Vineyard and wife Marsha of Broken Arrow, Oklahoma; John Vineyard of Webb City; Micheal Vineyard and wife Nancy of Colleyville, Texas; 4 grandsons; and 4 great grandsons. Funeral services will be held on Friday, April 27, 2018 at 2:30 PM in the chapel of Simpson Funeral Home in Webb City with Pastor Gary Balfour officiating. The family will be present for a visitation on Friday from 1:30 PM to 2:30 PM at the funeral home. Burial will be in Mount Hope Cemetery in Webb City. In lieu of flowers the family suggests memorial contributions to the Parkinson’s Foundation in his memory. Services are under the direction of Simpson Funeral Home in Webb City. Visit www.simpsonfh.com for online condolences. To send flowers or a remembrance gift to the family of Jay Dean Vineyard, please visit our Tribute Store. "Email Address" would like to share the life celebration of Jay Dean Vineyard. Click on the "link" to go to share a favorite memory or leave a condolence message for the family.